Take your brunch or afternoon snack up a notch with this simple dish that’s perfect for hassle-free entertaining. We often forget that mustard can bring so many elements to a meal – acidity, saltiness, smokiness and heat. At McEwan you can choose from a wide variety of local and imported mustards sure to impress! Toast the 2 bagels and evenly spread the Dijon mustard on each one. 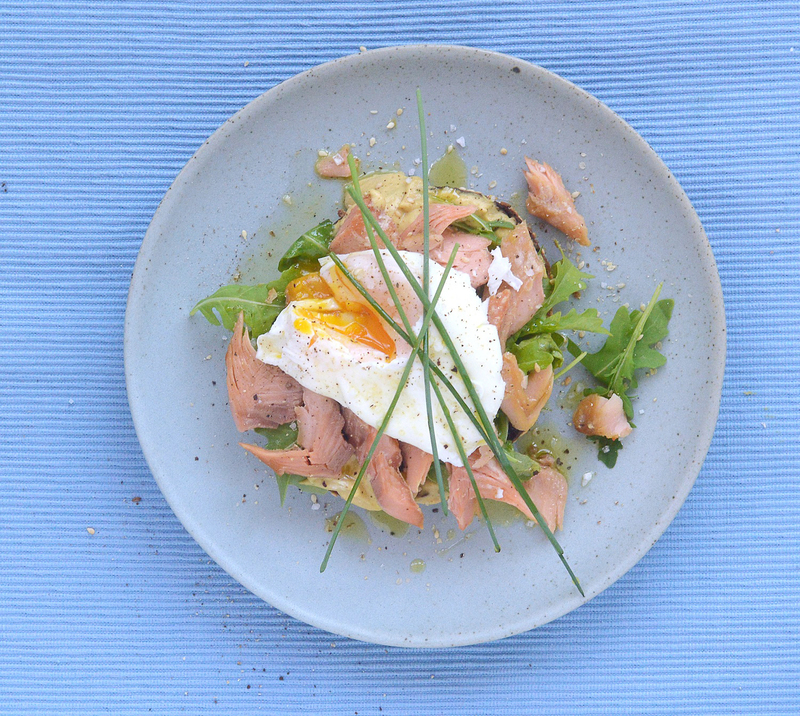 Cover with a handful of arugula and crumble over your smoked trout. Top each bagel with cooked eggs, sprinkle with fresh chives, cracked pepper & salt. 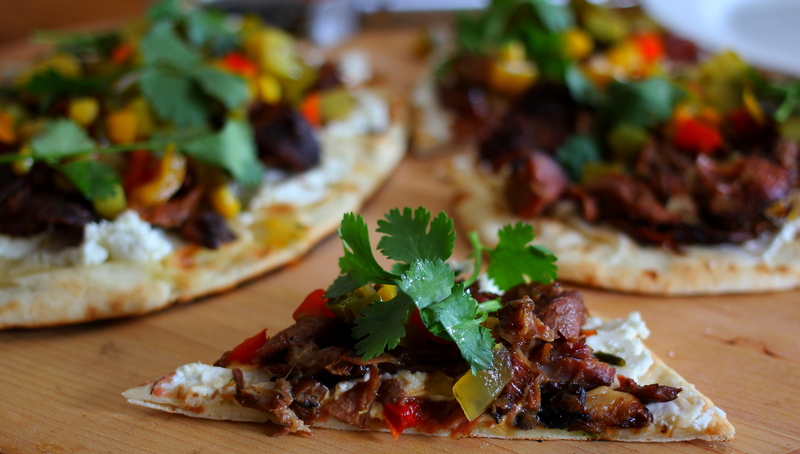 This delicious flatbread is a perfect quick and easy entrée or appetizer. 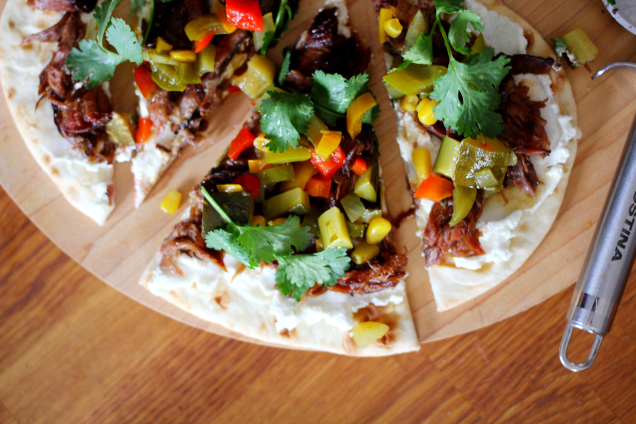 The soft naan bread is topped with warm and creamy goat cheese and succulent lamb shank. The star of the dish, McEwan’s Own Zucchini and Corn Relish, is what brings everything together adding that little bit of acidity to balance out the other intense flavours. Preheat grill to medium heat. Spread a thick layer of goat cheese on the naan bread. Shred the lamb pieces from the bone and place on top of the goat cheese slathered naan bread. Once barbecue is heated, grill each naan bread for approximately 2 minutes, or until bread and goat cheese are warm. Remove from the grill and top each flatbread with McEwan’s Own Zucchini and Corn Relish and garnish generously with fresh cilantro. Layers of Italian lady-finger biscuits, preserves, fresh peaches and white chocolate yogurt makes for an enticing culinary indulgence that is perfect for sharing. By adding velvety, sweet yogurt, soaked into delicate biscuits, you will turn an ordinary trifle into a luscious dessert with the right amount of intensity! Open jar of McEwan’s Own Italian Peach Preserves, drain liquid and spices from peaches. Remove peach flesh from the pits and set aside. Using a food processor, pulse the peaches until spreadable or desired texture is achieved. 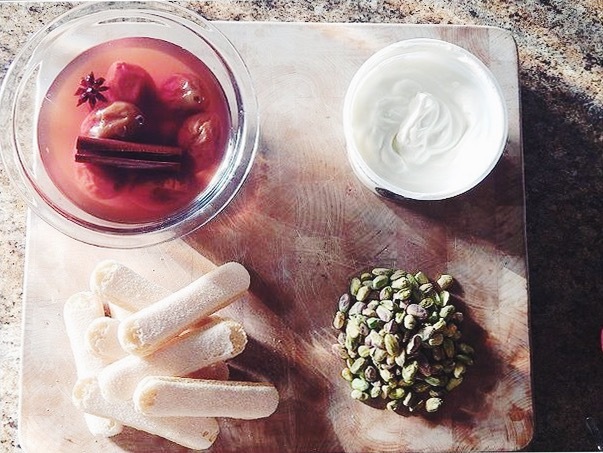 Cut Saviorie biscuits to the size of the dish you are using (if necessary) and place on the bottom of dish. Peel and dice ½ of the peach into tiny bit size pieces, set aside. Keep the other half for garnish. In this order spoon layers on top of the biscuits: Peach liquid*, yogurt, fresh peach pieces. Add a second layer of biscuits and repeat the layering process until the top of the dish is reached. Cover dishes and refrigerate for 2 hours. Crush pistachios, enough to garnish the dish. 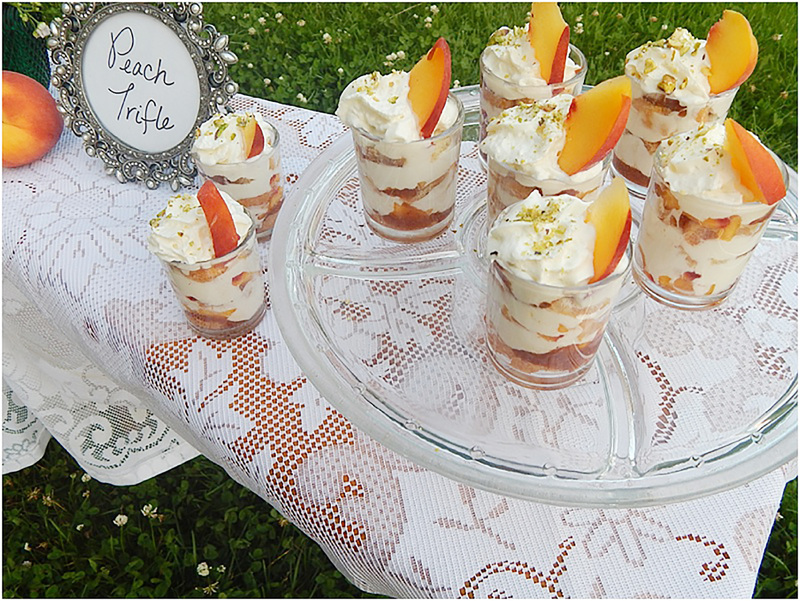 When ready to serve, top dish with whipped cream, crushed pistachio and a peach slice. Tip ~ The leftover peach preserve liquid makes for a delicious ice cream topping! Bring the five star flavour experience to your dinner table in minutes. 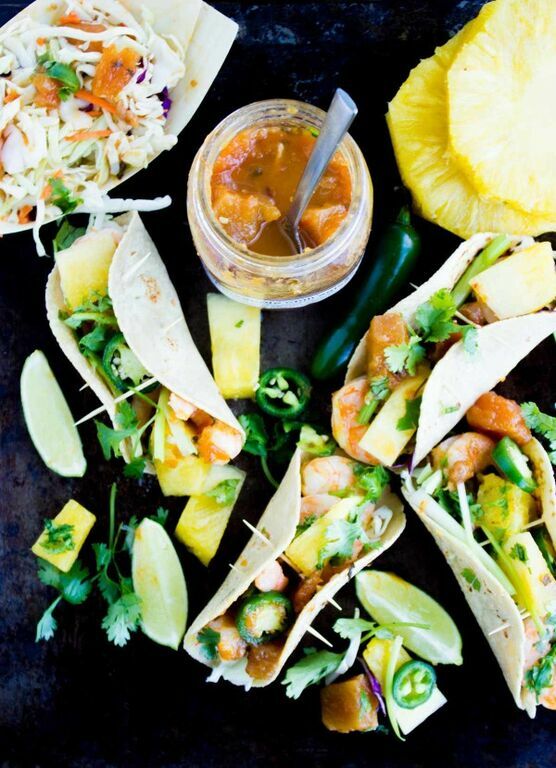 This Shrimp Pineapple Chili Salsa Tacos recipe is a 15-minute meal that packs a punch of flavour with fresh vibrant colours that give a deluxe seafood feel. 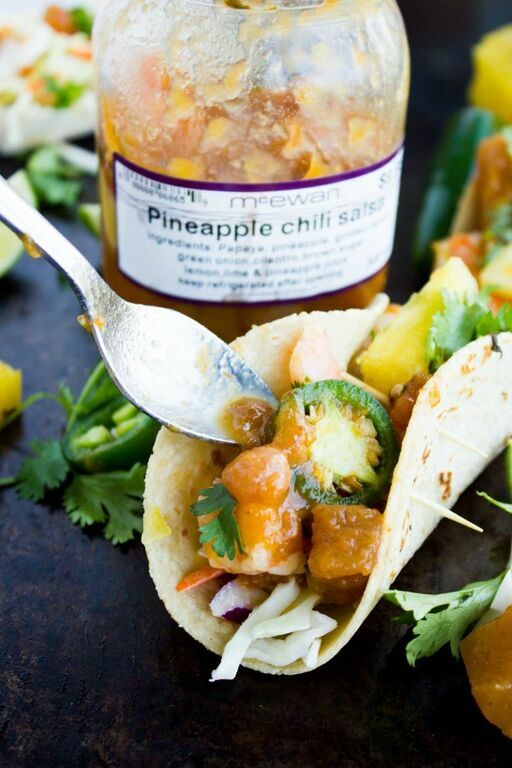 Using McEwan’s Own Pineapple Chili Salsa you can add a sweet, tangy and sour finish to the tacos! Set the oven to broil and allow it to heat up for 15 minutes. In the meantime, toss the coleslaw with 2 tablespoons of the McEwan’s Own Pineapple Chili Salsa and add 1 tablespoon of chopped cilantro to the slaw mix. Set aside. Toss the shrimps with salt, pepper, olive oil and spread on a single layer in a baking sheet. Place the shrimps on the top most rack of the oven to broil for 3-5 minutes (depending on the size). Once the shrimps are ready, add 1/3 cup of the pineapple chili salsa to the shrimps and toss them very well to infuse the flavours. Take a mini tortilla and top it with a couple tablespoons of coleslaw (more or less to taste), the pineapple chilli shrimps, scallions, fresh pineapple chunks, jalapeños, cilantro and a squeeze of lime (more or less of each topping according to your taste). Take a toothpick and secure the tortillas from side to side to hold in the filling. While most foods like candy vs caviar are favoured quite differently from childhood to adulthood, cheese has the amazing power to transcend the ages. We fall in love early on in life and never let go. 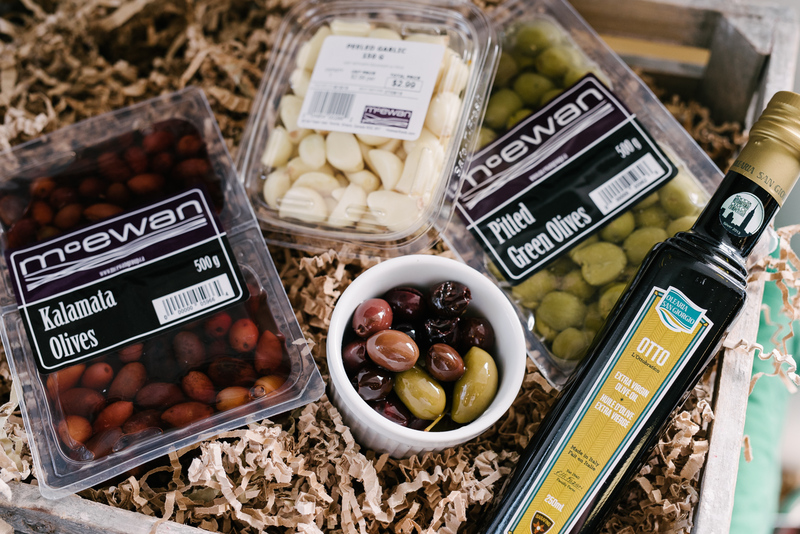 Thankfully, McEwan’s offers a wide range of local and imported cheeses to impress the pickiest kid and the most sophisticated adult palates. With the help of their staff, it’s easy to build a perfect cheese platter with selections like St. Agur Blue from France, 18 month aged Manchego from Spain, Grey Owl Goat from Quebec, and one of my personal favourites ~ the Upper Canada Cheese’s Niagara Gold from Ontario. McEwan’s staff can also help you select the right cheese for your recipe. Serve with a colourful fruit salad, Greek yogurt and a homemade granola, and you’ve got a light yet impressive mid-morning meal. Preheat oven to 400°F, lightly grease a muffin tin, and place in the oven while the oven warms up. In a large nonstick skillet, heat the olive oil over medium heat. Add in the garlic and sauté until fragrant, about 1 minute. Add in the Swiss Chard leaves and ¼ cup of water. Cook over medium heat until well wilted and significantly reduced in volume, about 5 minutes. Remove from heat to a medium bowl. Meanwhile, in a small food processer, puree the cottage cheese with the Parimigiano Reggiano cheese until the cottage cheese loses its curd-like texture. Add the cheese, rehydrated sundried tomatoes, lemon zest, and salt and pepper, to taste to the chard. Then add in the beaten eggs and mix until well combined. Cut the three sheets of phyllo in half down the middle. Lightly brush a little olive oil onto each square, then fold it in half, brush a bit more on, then fold again to yield a slightly rectangular square. Press into the muffin tin and trim the excess. Repeat with all 6 pieces. Fill the phyllo with the cheese and Swiss Chard mixture and top with a light sprinkling of extra Parmigiano Reggiano. Bake for about 20 minutes, until the filling feels set, the phyllo edges are brown and the bottom of the phyllo is light brown. Serve with finely chopped parsley and hot sauce, if desired. Serves 3-4. 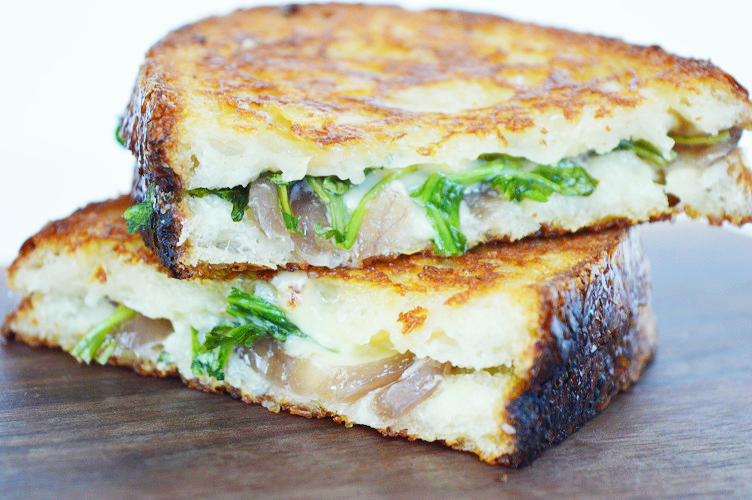 Take your grilled cheese to the next level with a sharp, aged cheddar beautifully balanced by tangy pickled onions and spicy arugula. It’s quick, simple and completely delicious. Butter one side of each slice of bread and lay one slice butter side down. 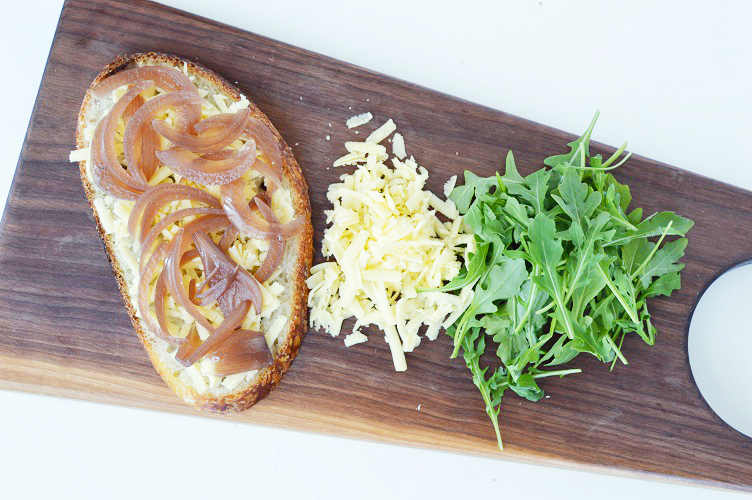 Top the bread with half of the grated cheddar, McEwan’s Own Pickled Onions and arugula. Sprinkle on the rest of the cheese and top with the second slice of bread, butter side up. Heat a pan over medium heat and place your sandwich gently into the pan. Grill the sandwich until the bottom is just starting to turn golden and the cheese has begun to melt, about a minute or two depending on how hot your stove is. Carefully flip the sandwich and give it a good press with a spatula. Ensure maximum contact with the pan. Grill until golden brown on that side (another minute or two) and then flip again. Press the sandwich down with your spatula and grill again for 30 seconds to a minute until the other side is crispy. With the continual rise of heart disease and mounting blood pressure concerns, people are becoming more conscious of the amount of salt they consume, and are opting for bolder flavoured quality salts in place of sodium-laden processed fare. Five years ago your choices were limited to kosher, iodized, or maybe sea salt. Today there is a wide range of ways to not only add seasoning, but to also add an easy hit of flavour to your meal. McEwan stocks an impressive selection of gourmet salts ~ Tentazioni’s Truffle Salt, Terre Exotique’s Cyprus Salt with Saffron, Flor de Sal’s Black Olive Sea Salt, and Wild Hibiscus Flower’s Pyramid Salt Flakes. This recipe combines sweet shrimp and peaches, sour lime, salty feta and an extra kick from the chili pepper salt. It makes for a perfect weeknight supper served along a light salad, or can be served as a passed hors d’oeuvre for a dinner party. Soak skewers in cold water for at least 30 minutes to prevent burning. Prepare outdoor grill for direct grilling on high. In a medium bowl, combine the oil, lime juice and honey. Add the shrimp and peaches, and toss to coat fully. Thread shrimp and peach pieces onto 8 skewers. Grill for 3-4 minutes, turning once, or until browned and the shrimp become opaque throughout. Pile onto a serving platter and sprinkle with the lime zest, the Esplette Chili Pepper Salt and the crumbled feta cheese. Serve with lime wedges and cilantro. Serves 4. 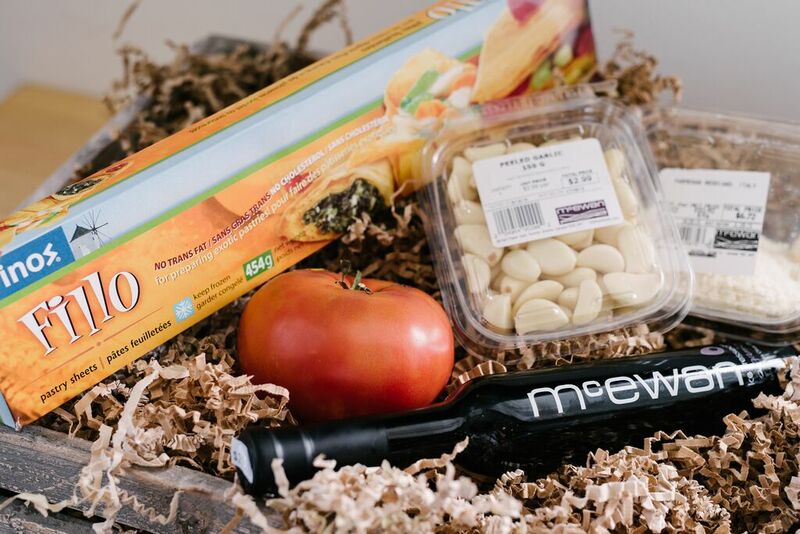 Here at McEwan, we’ve known for a long time that the way to anyone’s heart is undoubtedly through their stomach. People do love to eat and there’s something particularly appealing about busting out the grill. And for every special someone in our lives there is a great BBQ sauce to add to the grilling flavour and fun, appealing to their spicy, smoky, sweet, or sour tastes. 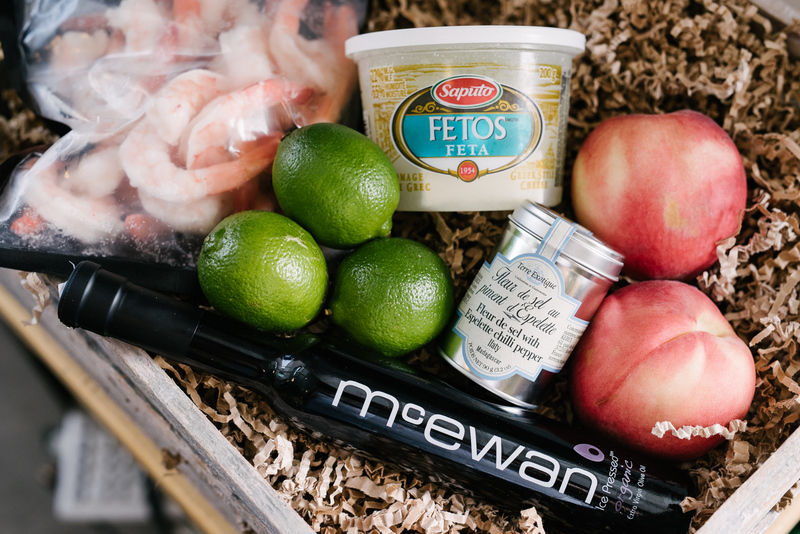 So this summer, do the special person in your life a favour and head to McEwan for the perfect saucy slather to dress up your next grilling feast. 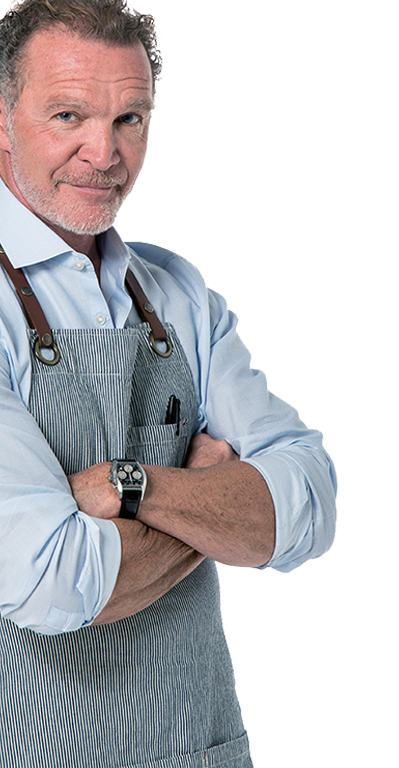 McEwan’s team has spent countless hours testing out some of the world’s most unique and delicious BBQ sauces. From sweet Memphis style, to Mexican chipotle, to Jamaican Rum-spiked and more ~ there is something to satisfy everyone. They’ve even got a line of McEwan’s Own blends including a Wild Blueberry, Spicy Apple, and Cola infused sauce. Obviously, the most popular use for BBQ sauce is on barbequed meat, with different flavours working best with different fare. Go for a Carolina vinegar-based sauce like the one from Guy Fieri when pulling fatty BBQ pork. The ketchup-based Kansas City sauces like the line by Zarda Barbeque is delicious slathered on ribs. Richer sauces like McEwan’s Own Cola BBQ is irresistible on beef brisket, while lighter Honey based sauces like Rufus Teagues is great on chicken drummettes and wings. But why should meat have all the fun and flavour? In this recipe I use one of my favourite sauces, Bear Claw, which has the savoury addition of Chipotle to add a smoky note to this healthy shrimp dish. Serve this low fat, high protein dish alongside a cup of McEwan’s cold gazpacho and you’ve got a satiating well-balanced meal. Brush the corn, bell peppers, zucchini and peaches with olive oil and season with a pinch each of salt and pepper. Grill until tender and slightly charred on all sides, about 9 minutes for the corn, 6 minutes for the zucchini and bell pepper, and 2 minutes for the peach. Remove from the grill. Once cool enough to handle, peel away the charred skin from the pepper. Dice all of the vegetables and remove the corn from the cob. Set aside. 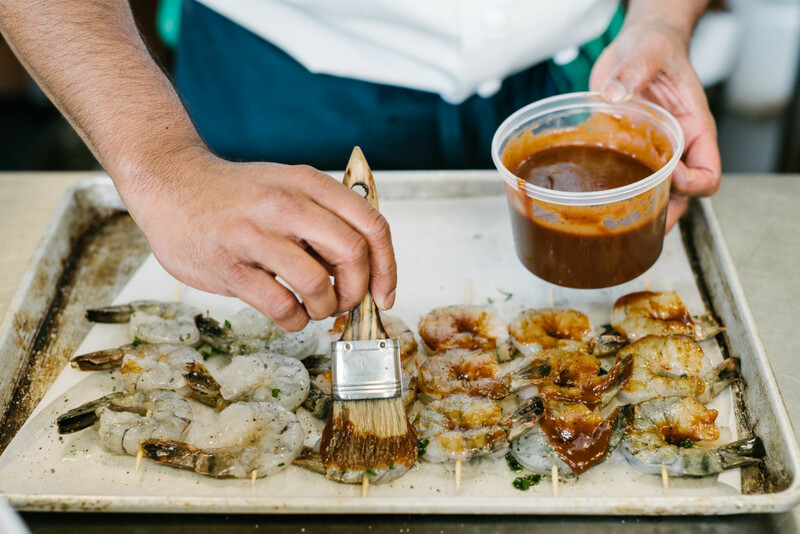 Meanwhile, season the shrimp with salt and pepper, anchor them onto a skewer and brush with the Bear Claw BBQ sauce. Grill on both sides until cooked through and opaque, about 1-2 minutes per side. Set aside. Heat the 1 ½ tbsp. of olive oil in a large nonstick skillet over medium heat. Add in the black beans and lima beans and toss until warmed through. Season with a pinch each of salt and pepper. Add in the cooked vegetables, the lime juice, and the additional ¼ cup of Bear Claw BBQ sauce. 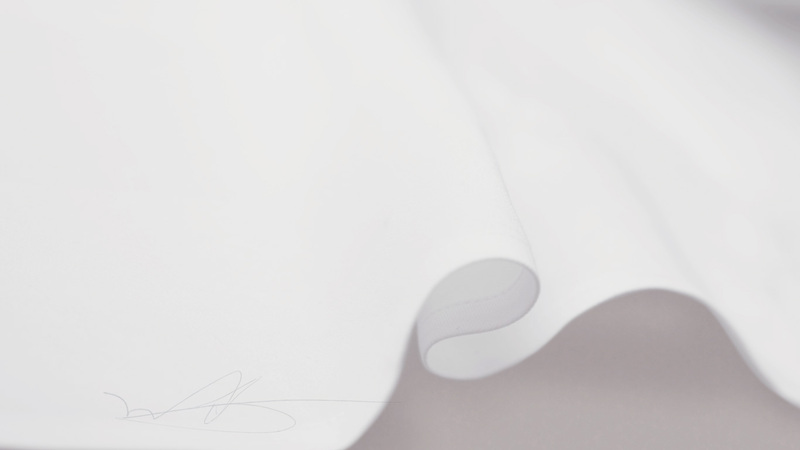 Toss to coat. 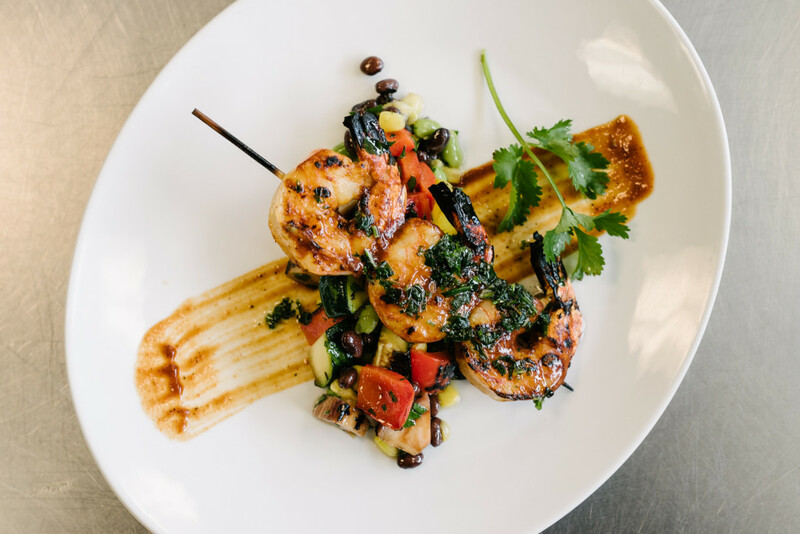 Transfer to a serving bowl, garnish with the queso cojita and cilantro (if using) and top with the grilled shrimp skewers. 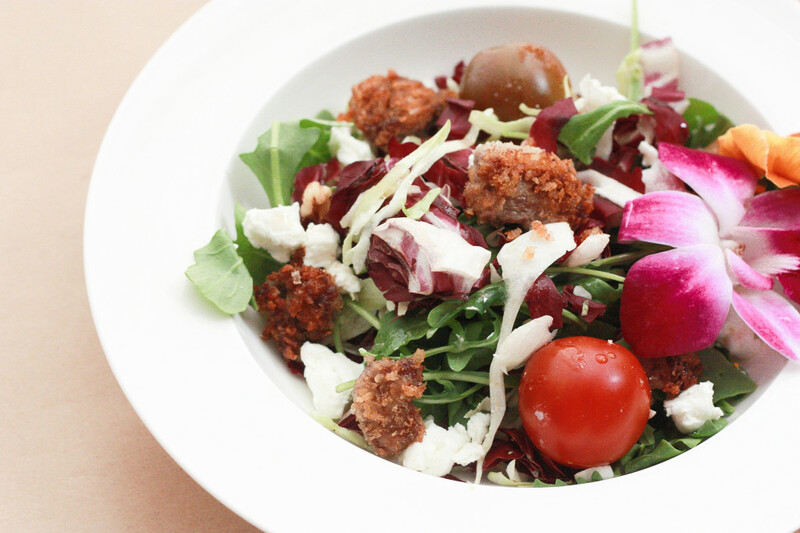 Embrace the warm weather with this fresh and flavourful Truffled Steak Salad. Sharp little bites of marinated and seasoned steak are nestled among fresh, crisp greens, sweet tomatoes, and crunchy, mild walnuts. 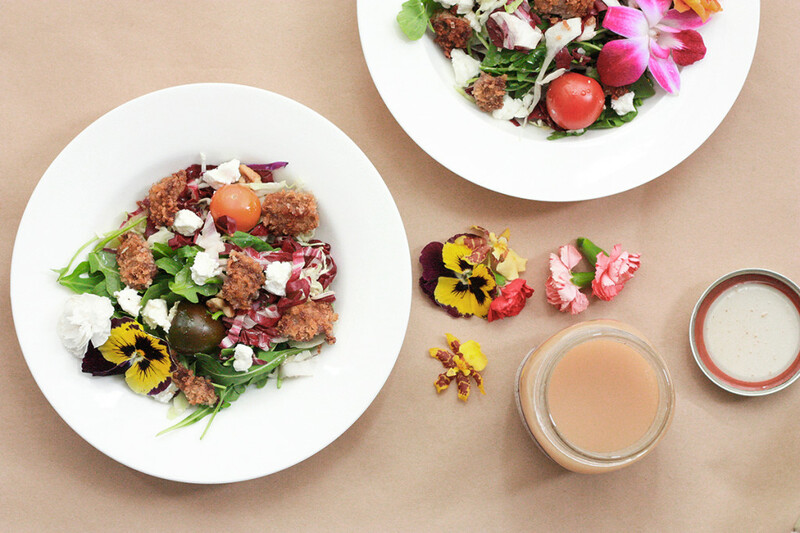 Topped with a crumble of tangy chèvre, then drizzled with McEwan’s Own Truffle Vinaigrette, this is a very quick and simple salad designed to impress. Cut the steak into small, bite size pieces. Season with salt and pepper, then toss with 2 tablespoons of the McEwan’s Own Truffle Vinaigrette Salad Dressing, making sure all the meat is coated. Toss the meat in the breadcrumbs, making sure they’re evenly coated. Heat a tablespoon or two of olive oil in a large frying pan, and quickly fry the meat for two minutes. Flip to ensure both sides are browned and crisp for a medium/medium-rare steak. Add the steak bites to the McEwan’s Own Arugula Salad Mix, then toss. Add dressing and toss again. Top with the crumbled chevre and some freshly cracked black pepper.